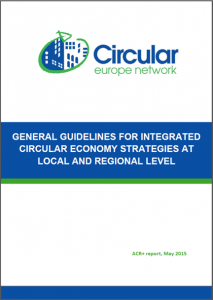 This publication aims at explaining the potential role of local and regional authorities, and at helping them to draw up integrated and efficient circular economy plans. Even though acknowledging the broader concept, the guidelines focus mainly on materials, considering that it is difficult for local and regional authorities to encompass all topics at once and since material resources represent the core element of circular economy. The current document should serve as a set of first guidelines, and is intended to be completed with examples of best practices to set such strategies, as well as concrete cases of circular economy. The guidelines are also available in the following languages: Catalan, Italian, Portuguese and Spanish. To translate the guidelines in another language, ACR+ members are invited to contact the Secretariat and to follow some easy steps. Italian (including the presentation of 8 Italian good practices of circular economy).